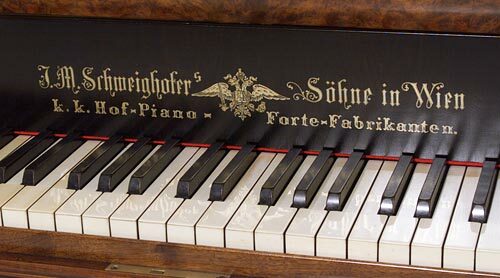 If you have any information about Schweighofer pianos like pictures, history, etc, please send them to be added to this website. This website is dedicated to the instruments and history of the Schweighofer piano makers of Vienna, Austria, which were active between 1792-1938. What's new: Chat box, Updated history, How do I find the serial number of my piano? We do not take responsibility for any possible inaccuracies of the information contained here or for the contents of other websites linked here, which are not under our control.